Murray  in 1873 described the lesion as molluscum fibrosum which was a synonym used for neuromatosis in children. Synonyms include systemic hyalinosis and disseminated painful fibromatosis. Recently used term juvenile hyaline fibromatosis, was coined by Kitano et al. , in 1969. Juvenile hyaline fibromatosis (JHF) is characterized by papulo-nodular skin lesions, soft tissue masses, joint contractures, gingival hypertrophy, and osteolytic bone lesions. ,, The accumulation of an amorphous, hyaline material is typical in the skin and the other organs. ,, Only 70 cases have been described in the literature. Our case was that of a six-year-old child born of non-consanguineous marriage, admitted for multiple, progressively increasing swellings over face, back and scalp since childhood [Figure 1]. No skeletal abnormality was seen. Systemic examination was unremarkable. With a clinical diagnosis of multiple lipomatosis, he underwent surgical intervention. We received multiple well circumscribed, soft to firm, grey white masses largest measuring 3.5 × 0.5 cm. Cut section showed uniform homogenous appearance [Figure 2]. 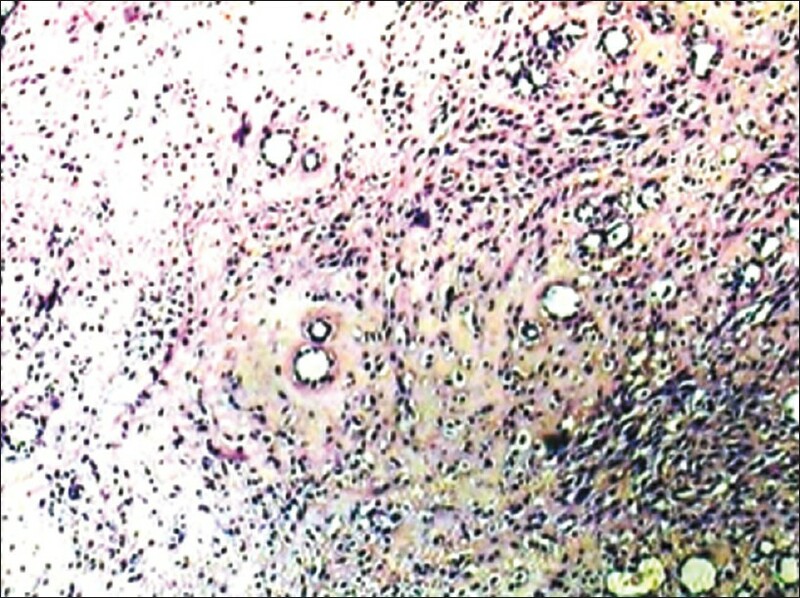 Histopathological examination showed a hypocellular lesion with spindle-shaped cells embedded in abundant homogenous, amorphous, eosinophilic, hyaline [Figure 3], periodic acid schiff (PAS) positive diastase resistant material. Many cells had vacuolated cytoplasm with nuclei lying in lacunae giving it a pseudochondroid appearance [Figure 4]. We rendered a diagnosis of juvenile hyaline fibromatosis. Panel of IHC showed vimentin positive [Figure 5], smooth muscle actin (SMA) negative, and S-100 negative, which confirmed our diagnosis. Family history of consanguineous marriage is significant. Its onset is in infancy or early childhood with a range of two to five years. The most commonly affected sites are the nose, chin, ears, scalp, back, and knees. Our index case was six-year-old lad, born of a non-consanguineous marriage and had multiple subcutaneous nodules with no skeletal abnormality. Light microscopic examination of skin lesions characteristically show paucity of cells and abundance of a homogenous, amorphous, eosinophilic extracellular matrix in which spindle-shaped cells are embedded. ,, Many cells show ghost cell/pseudochondroid appearance. Our index case showed similar histological picture. Osteoclast-like giant cells and calcification with psammoma bodies can be noted. Early lesions are cellular with little matrix, whereas older lesions show prominent ground substance with less cellular areas. ,, Immunohistochemically, the spindle-shaped cells are vimentin-positive but negative for alpha-smooth muscle actin and S-100 protein, and the hyaline ground substance is positive for type I and type III collagen but negative for type II and type IV collagen and tenascin. 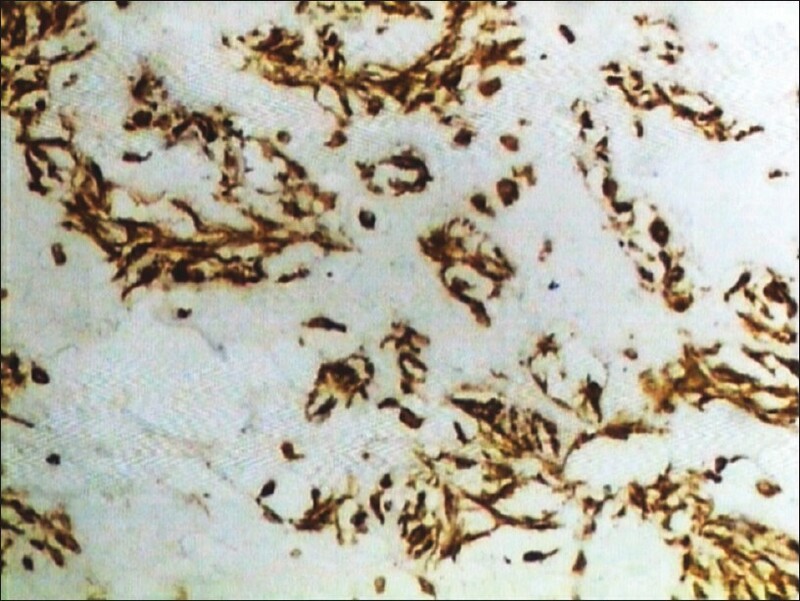 ,, Immunohistochemistry (IHC) confirmed our diagnosis. 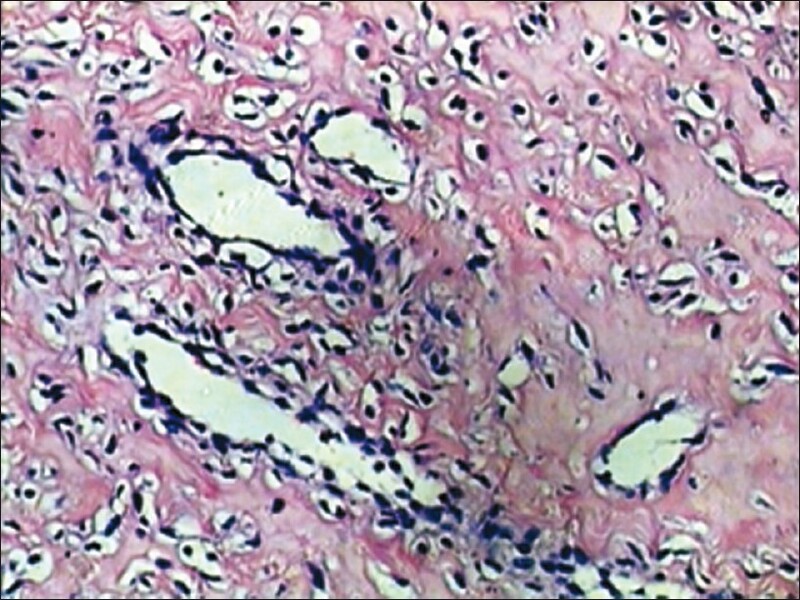 Infantile systemic hyalinosis shows similar histological features with a varying clinical picture. Some authors have stated that both represent two ends of spectrum. 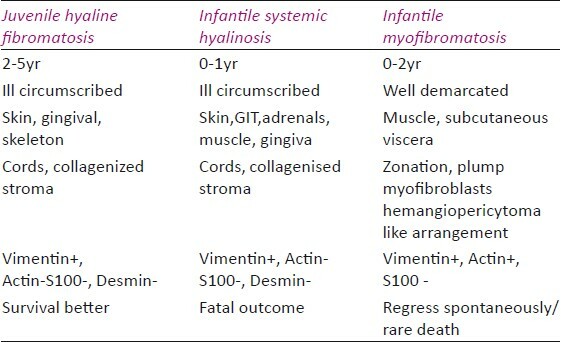 Infantile myofibromatosis is other close differential and differences between these three conditions are tabulated in [Table 1]. Although mode of treatment is surgical excision, prognosis is determined by number, size, location, and degree of functional impairment. Local recurrence rate is high. 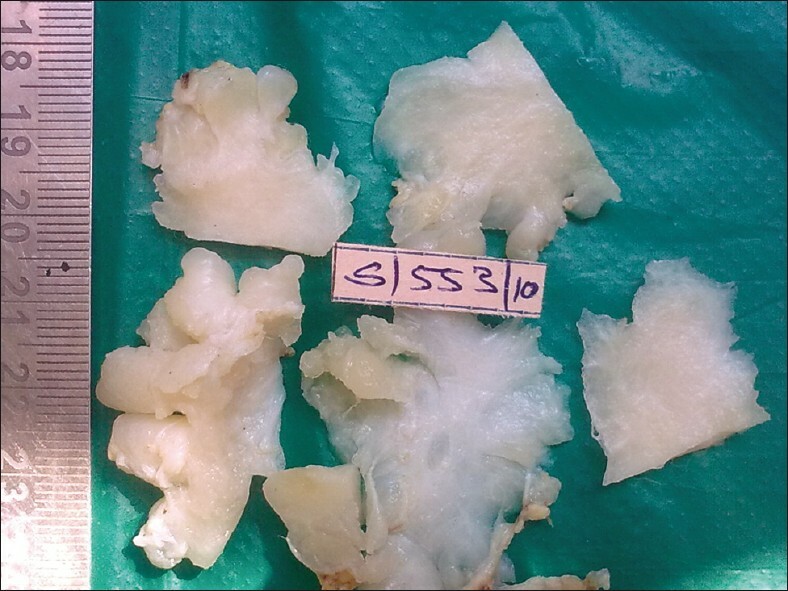 A single case showed an association of squamous cell carcinoma. There is no follow-up of our index case till date. Altafhusen A. Momin, Assistant Commissioner of Police, DGP Office, Colaba, Mumbai, India. 1. Murray J. 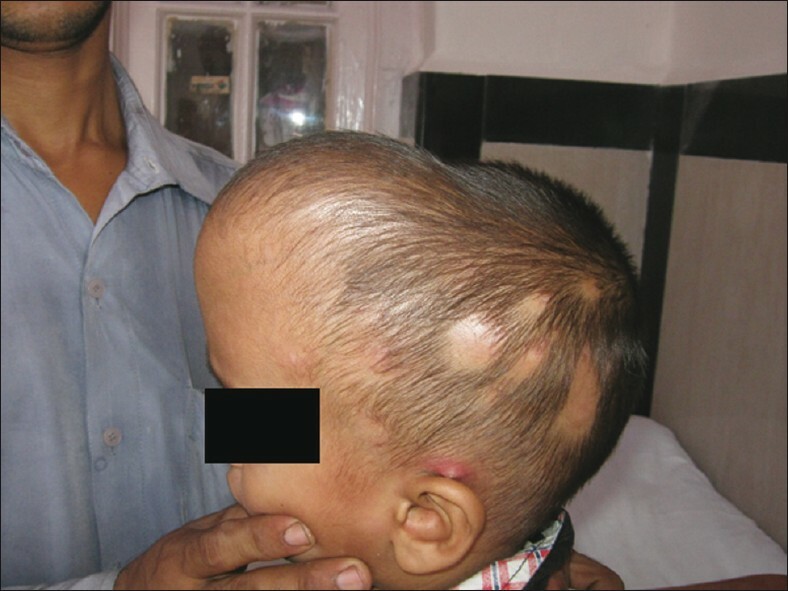 Three lenticular cases of molluscum fibrosum in children. Med Chir Trans 1873;38:235. 2. KitanoY, Honki M, Aoki T, Sagami S. Two cases of juvenile hyaline fibromatosis some histological, electron microscopy and tissue culture observation. Arch Dermatol 1972;106:877-83. 3. Yayli S, Uncu S, Alpay K, Yildiz K, Cimsit G, Bahadir S. A case of juvenile hyaline fibromatosis. J Dermatol 2006;33:260-4. 4. Malathi BG, Prabha CV, Padma SR, Muley PR, Jaychandran P. Juvenile hyaline fibromatosis-a rare case report. Indian J Pathol Microbiol 2006;49:257-9. 5. Ribeiro SL, Guedes EL, Botan V, Barbosa A, Freitas EJ. Juvenile hyaline fibromatosis: A case report and review of the literature. Acta Rheumatol Port 2009;34:128-33.